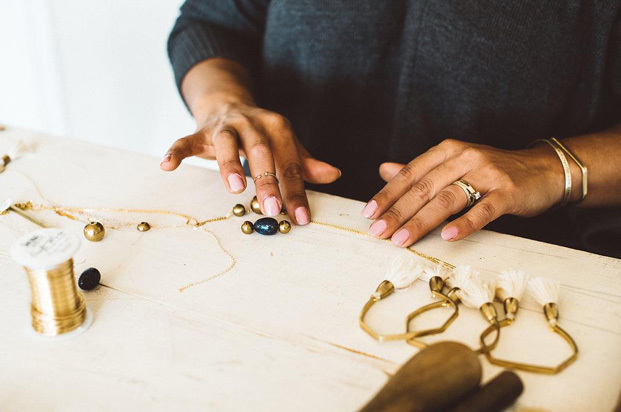 After moving to America from her home country of France and with no formal training, Anne Harrill began making jewelry as a way to get to know the other artists in her Cleveland community and to find her voice in her new home. Armed with an idea or theme for her new line, Anne will create sketched prototypes and work to design pieces that share a unifying message. When she’s finalized which pieces will make the cut, she will then bring her ideas to life with great attention to detail using traditional techniques such as forging, stamping and assembling vintage and curated materials. Gold plated gingko leaves make the cutest lariat. // Chain is 16k gold (nickel and lead free) // 31" long.